Storing items at Self Storage Plus is made easy by convenient features and an accessible location. Our self storage facility in Rockville, MD, offers a variety of unit sizes to accommodate every need. All of our storage units are ground-level, meaning you can easily reach your storage space without stairs or elevators. Our fenced and gated property with keypad entry allows you access to your storage space when you need it, 7 days a week from 6AM - 10PM. Our climate-controlled units keep your temperature-sensitive items free of exposure to harsh weather conditions, ideal for items such as electronics, documents, clothing, wood and leather furniture, or artwork. Some of our larger storage spaces even offer double-door entry, so that you can access your storage space from two sides, ensuring nothing is out of reach. Most importantly, our storage facility is staffed by a knowledge and friendly team of storage professionals, who know that cleanliness, reliability, and a high level of customer service are all a priority to our customers. Your items are secure here with security features throughout our facility including 24-hour video monitoring, electronic gate access with keypad entry, a well-lit and fenced storage property, and resident management. Take the stress out of move-in day whether you benefit from wide hallways with dollies and carts available to use in our climate controlled building, or the ultimate convenience of drive-up accessible storage. We also offer an active duty military discount, month-to-month leases, and online bill pay. At Self Storage Plus, we have options that allow you flexibility, convenience, and peace of mind. 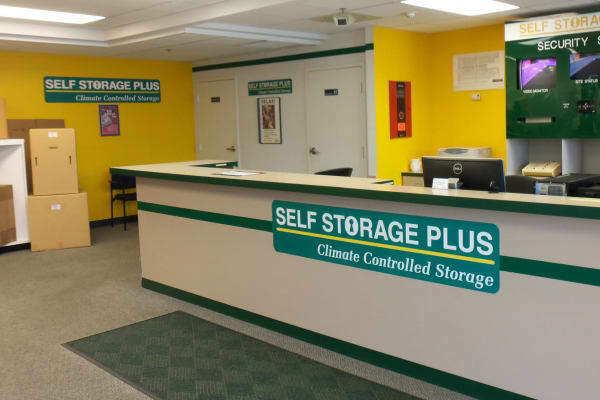 For self storage solutions in Rockville that meet your needs, contact one of our storage experts at Self Storage Plus today.